The Gen 2 A50 goes above and beyond for what seems to be a reasonable cost for a gaming headset. However, the Astro tries to justify the A50’s astronomical price tag by providing a premium experience. The more high-end vibe starts with the exterior of the headset, which sports a more solid-looking feel than flimsier-looking headsets. Despite using a fair amount of plastic, for example, it doesn’t look as plasticky as the Turtle Beach Ear Force PX22 or the Skullcandy PLYR 2. The A50 achieves this with its use of a smooth, matte-type plastic similar to the SMS Street by 50 ANC boutique headphones, as well as accents such as metal cylinders and logos. The nice design cues extend to its accompanying MixAmp Tx transmitter, which combines a matte finish with glossy accents as well as a grippy neon green bottom for preventing slippage. Admittedly, the stand looks plasticky and flimsy, especially compared to the headset itself. It still gets the job done, though, and houses both the headphones when not in use as well as the MixAMp Tx. 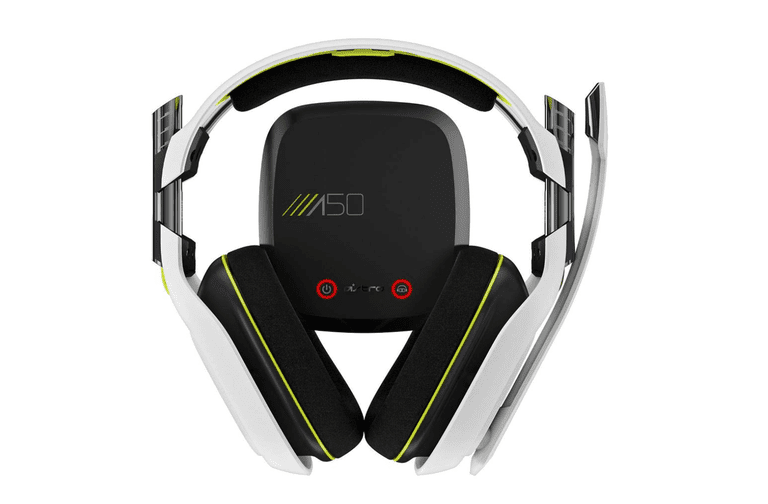 The Xbox One A50 does not come with the same MixAmp Pro setup you get from other Astro headsets such as the A30 Crossgaming headset. Instead, those features are built into the headset itself, which allows you to adjust chat and game volume balance by pressing on different sides of the right earcup plus overall volume via a knob. It’s not as easy to adjust as the knob dials of the MixAmp Pro but it also puts the controls within easy reach while getting rid of one more extra piece of gadgetry. Chat can be turned or muted simply by flicking the mic stick down or up, though this also comes at the expense of not having a removable microphone attachment. Battery life on a full charge for the headset is about eight to 10 hours, though mileage will vary based on your usage of chat. Unlike the ROCCAT Kave XTC headset, you can’t manually fine-tune the audio on the A50 for a custom setup, unfortunately. Instead, the A50 comes with three audio presets. First is “Media Mode,” which features more punchy low end for bass lovers. “Core Mode” has a more balanced audio profile while “Pro Mode” emphasizes higher frequencies for competitive gaming. Overall, the Dolby Digital 7.1 surround sound is excellent, allowing you to hear certain audio nuances that you normally wouldn’t hear without the use of a good stereo setup. There’s nice separation between the lows, mids, and highs, and it makes gaming truly feel like a cinematic experience. It even makes games you don't normally enjoy feeling like a good time because of the pleasant audio. Chat also worked well and provided a solid experience. Connection with the Xbox One controller is done via a wired setup, which defeats the purpose a bit for a wireless headset. Also, note that the MixAmp Tx does not come with its own power adapter but takes up one of the USB ports on the back of your Xbox One. The included charging cord is pretty short, by the way, so you’ll need to concoct an alternative microUSB charging option while playing if you don’t want to be gaming within a foot or so of your TV. Overall, however, the A50 wireless headset provides one of the best audio experiences we’ve had from a gaming headphone, and we’ve certainly tried out a fair share of headsets for gaming. Add the fact that the Xbox One version is quite versatile — we verified with a source from Astro that the A50 also works with other systems such as PS4, 360, PS3, PC, Mac, and mobile — and you’ve got a setup that does not tie you down to one device. As long as you can swallow the price tag, the Astro A50 Wireless Headset for Xbox One is one of the best gaming headsets available.